What's next in suspense from author Sandra Brannan? 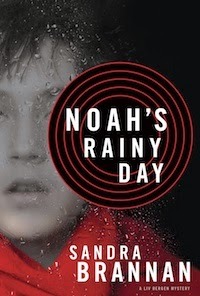 The latest installment in the Liv Bergen Mystery Series, Noah's Rainy Day combines classic Liv Bergen irreverence and brainpower with an unflinching look at the darkest human motives, while a whirlpool of increasingly terrifying events threateners to engulf Liv and Noah both in one final rainy day. All four thrillers in the Liv Bergen Mystery Series are $0.99 each through November 11th, so don't miss out! Newly minted Special Agent Liv Bergen races against time to solve a child kidnapping—which could take a fatal turn—with the help of her gifted nephew Noah. Now, freshly returned from training at Quantico, FBI agent Liv Bergen is thrown into her first professional case. Working side by side with veteran agent Street Pierce, enigmatic agent and lover Jack Linwood, and her bloodhound Beulah, Liv must race to find five-year-old Max—last seen at the Denver International Airport—before his Christmastime abduction turns deadly. Meanwhile, Noah, housebound, becomes wrapped up in identifying the young face he sees watching him from his neighbor’s bedroom window, but he can neither describe nor inscribe what he knows. And his investigation may lead to Noah paying the ultimate price in fulfilling his dreams.